Fall is a beautiful season, complete with breathtaking colors, a slight nip in the air and the promise of quality time with family for the holidays. Make the most of the ambience by creating a cozy outdoor space to take in the colors before winter settles in. Your first priority should be comfort, and the most important factor in comfort is warmth. We recommend using a fire pit to create a soft, inviting glow and relaxing heat. 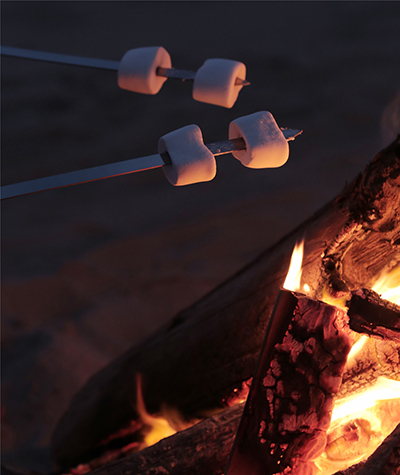 Plus, the fire will keep away late-season bugs and provide the opportunity to make tasty treats like s’mores! Roll up some blankets and put them in a wicker basket in case the first isn’t hot enough – encourage snuggles and coziness of the holidays just around the corner. Because it gets darker earlier, make sure you use some exterior lighting to supplement the glow of the fire. This will keep people safe while they’re mingling and also help create ambiance. We suggest using less harsh, warmer-toned lights to accent the oranges and reds of the foliage, rather than bright fluorescents more reminiscent of summer sunshine. Hortons has a wide selection of lights to create that perfect mood, plus at our La Grange location, we have an ACE Hardware on site to help you find the fire pit of your fall fantasy!